Around 600 million people across the world will tune in to watch the drama unfold at the 172nd annual Grand National on April 6. It is the richest jumps race in the world, replete with a £1 million prize purse, and it attracts all the leading long distance chasers in the business. The National transcends the sport of horseracing and stands as one of the great sporting events in the entire calendar. Even people with minimal interest in the National Hunt scene will enjoy a cheeky flutter and the anticipation will continue to mount as we approach the big day. The Grand National at Aintree captures the imagination due to the epic nature of the trip, which is run over a gut-busting 4 miles and 514 yards. The horses must clear 30 fences over two laps. These are not just any fences, they are fearsome, treacherous fences like Becher’s Brook, The Chair and Canal Turn – so gruelling they have names. The Chair is the 15th fence and, at 5ft 3ins, it is the tallest in the race. The runners must clear a 6ft open ditch as they take off and land safely on the far side, which is 6ins higher. Two jockeys lost their lives at this fence in the 19th century. Canal Turn provides a number of problems for jockeys and their mounts due to the 90-degree turn that immediately precedes it. Several horses refuse to jump the Canal Turn and it has witnessed several pile-ups over the years. Becher’s Brook is the 6th and 26th fence, named after the jockey who fell from his mount there in the first ever Grand National and took shelter in the brook. No wonder 63% of the horses do not complete the race. 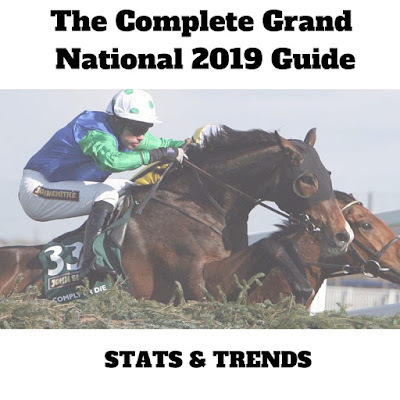 The Grand National is famous for its huge field of leading jumpers from across Great Britain, Ireland and further afield. A total of 112 entries have been received for the 2019 renewal, but a maximum of 40 runners will start the race. This year Tiger Roll fever is certain to sweep the nation. Gordon Elliott’s star nine-year-old is bidding to become the first runner since the legendary Red Rum in 1974 to win this famous race for the second year in a row. It is a monumental ask, but he just won a second consecutive Cross Country Chase at the Cheltenham Festival, finishing a comfortable 22 lengths clear of the chasing pack. Tiger Roll has proven himself to be a brilliantly versatile horse and he will try to defy a weight of 11 stone 1 pound to win the race. If you check out the sports spread betting markets, you will see that Tiger Roll is out in front, ahead of the likes of Anibale Fly. However, it is more than a decade since a favourite won the National, and we have seen several long odds victors in recent years, so many punters will prefer to look at long shots. It always descends into a thrilling war of attrition and it will be fascinating to see who prevails this year. A £1 million prize purse is on offer for the Grand National, but only 25% of the runners will receive a piece of it. The winner is given £561,300, which could be a life-changing sum for some of the smaller owners. The runner-up takes home £211,100, while the third-placed horse is given £105,000. That drops to £52,700 for fourth, £26,500 for fifth, £13,200 for sixth, £6,800 for seventh, £3,600 for eighth, £2,000 for ninth and £1,000 for the horse that finishes 10th. Punters love to lump on the favourite at the Grand National, but it is worth noting that these horses are only successful 15% of the time. Spectators at Aintree witnessed 7/1 favourites romp to victory in both 2006 and 2008, but since then the long-shots have ruled the roost and Tiger Roll will now aim to defy that trend. The shortest-priced winner was 11/4 shot Poethlyn in 1919. Contrast that with 100/1 hopeful Tipperary Time, who won in 1928 as one of just two horses that finished the race. Peter Simple is the oldest horse to ever win the race, at the ripe old age of 15 in 1853, while five different five-year-olds have won the race, but none since 1909. Nowadays horses aged 10 or over have the best recent record. Horses that either won or placed last time out have also flourished here, and you should look for runners that have secured victory over hurdles at some point in the season. Irish raiders have dominated in recent years, which is positive for connections of Tiger Roll, but trainer Gordon Elliott will have a strong hand as he will not want to put all his eggs in that basket. Horses aged eight or lower have struggled recently, as have those aged 13 or older, so the sweet spot really is 9-12. Normally you want the horse to be well rested, as runners that have raced in the previous 50 days struggle with this epic trip. Runners that were tested to their limits at Cheltenham usually flop in the National, but Tiger Roll might be excused as he coasted to victory. Twenty-six of the last 27 runners were officially rated 137 or higher, which is also worth keeping in mind. Twenty-five of 27 winners had previously won over a distance of at least 3 miles, so you should look for horses that can handle a long trip. At least 10 chase starts has been the minimum requirement for National winners over the past decade.